If you don’t have access to country ham in your part of the country, substitute thick-sliced prosciutto or order it online. In a medium bowl, combine the ricotta, mascarpone, and honey until smooth. Reserve for topping. Preheat the grill, roll out and shape the dough, and grill the first side of the crust per the master instructions for gas or for charcoal. Use tongs to transfer it to a peel or rimless baking sheet. Flip the crust to reveal the grilled side. Spread the entire surface with the jam. 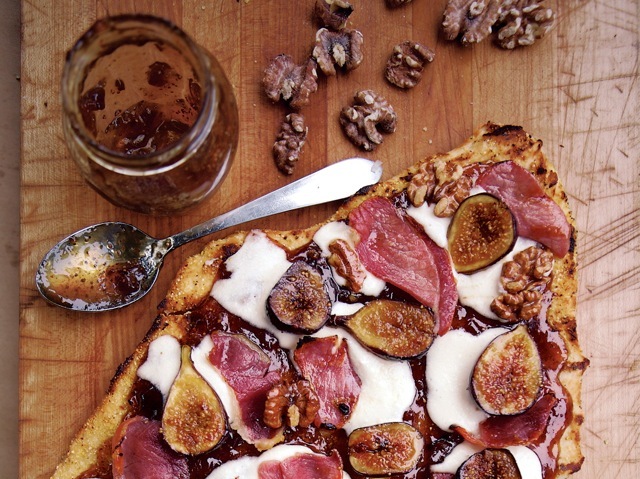 Artfully arrange the fig slices on top and sprinkle with the ham and walnuts. Spoon small dollops of the ricotta-mascarpone mixture over the top. Finish grilling the pizza per the master instructions. Remove from the grill and season with pepper. Since the ham is salty, taste first, then salt only if necessary. Slice and serve immediately.